The iOS 7.1 beta 4 download update goes available to developers this evening. Apple rumored to be already rolling out the update to Apple Seed program users, and now iOS 7.1 beta 4 download goes available for iOS Developer Center users. The update comes after two weeks of third beta release of iOS 7.1 to developers. 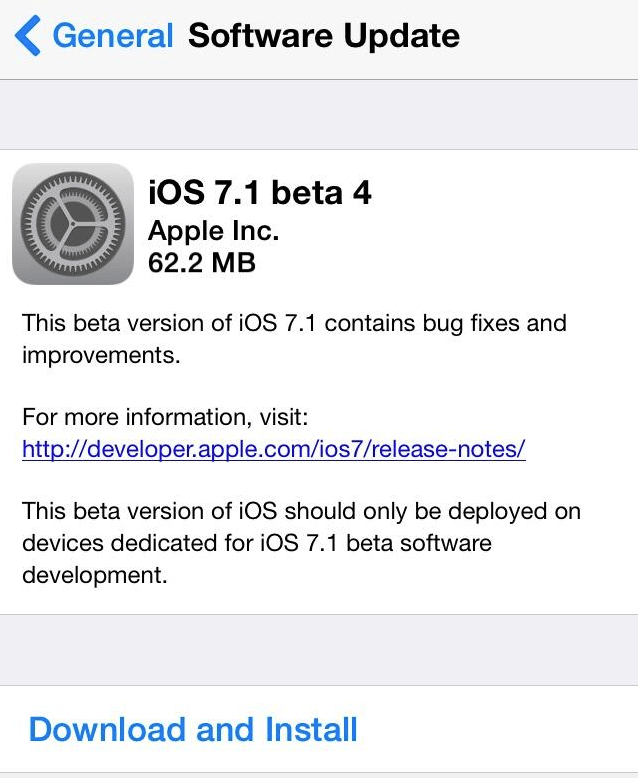 Apple is undoubtedly ramping up iOS 7.1 beta development, and released beta 4 update to developers. The beta update is available for iPhone, iPad, and iPod Touch developers. You can run this update on any registered UDID iOS device. iOS 7.1 beta 4 comes up with build number 11D5134c. The iOS 7.1 beta 4 download update is also available via an OTA update, and as well as complete IPSW download from iOS Dev Center. It introduces minor changes in iOS 7.1 running devices user-interface. We are ourselves are downloading the update to keep track on latest changes. However, we have learned few changes from our fellow blogger friends: The iOS 7.1 beta 4 comes up with introducing new animations for “Slide to Unlock”, and “Slide to Power off” dialogues. According to famous Jailbreak hacker, iH8sn0w, the iOS 7.1 beta 4 download update will expire on Monday, March 3, 2014. The update is only meant for developers, but if you are interested in helping out developers and want to install iOS 7.1 beta download then you need to get the iOS 7.1 beta 4 download direct links from our download page. iOS 7.1 beta 4 Download: What’s New? Bug fixes – all known issues! New voice gender for Siri UK on iPad devices. The download links for iOS 7.1 beta 4 update is currently uploading on our direct links server, you can check out the current progress here on our iOS 7 Beta download page.